How are you, I hope you are fine? It's my pleasure to congratulate you once again on your compensation fund and I am here to help you base on your trust and sincerity with me. The board members of the committee has empowered me to handle the release of your compensation and with all respect I will do my best, which I believe you will reward me after a successful claim of your fund. Now, what you need to do is to provide all the documents involved in your transaction until your fund as been delayed. And tomorrow morning I want you to write to the committee and request for your application form which will cost you 291pounds but I will have a deal with you to help you purchase it from my pocket. in-respect of your requested that how can you trust me. I am sending you a scan copy of my working identification card which I believe it will be confidential between us for the period of your claim in order to protect my imagine and my position as the Chairman of this Committee. I will like to invite you to meet me in London for further introduction, I will appreciate you having a dinning together with my family. I want you to follow up your compensation reward according to my instructions, which I believe you will be one of the awarded members to get his compensation in few weeks. I believe 2012 will be a very good year for you and I want you to be very careful in dealing with anybody or groups of people on a transfer basic. Because some are real and some are opposite. You are very lucky to be among those whom our investigation agencies tracked their fund in a security companies, Embassies, Banks and etc. I will be at office by 10am London time, so I will be glad if your message will be the first on my desk to handle base on your compensation form request. Please let your message to the committee from now on be official and no communication with me from the committee email base on any instruction you want from me. All my support to you must be confidential. Thanks as I wait your reply. What is holding you back, I am waiting for your reply and your request from the committee. Write to the committee and request for your application form, because we have to pass through the normal I will pay for the fee. I want you to act fast so that I can approve your payment soon. Send this message below to the committee email and i will send you the form from there you will fill it and sign it and scan it back to the committee. I know maybe because of your experience you are sacred and thinking this is not real, I want you to know that this is real and you are lucky to have this opportunity. Even me as the chairman of the committee I don't have such amount of money in my account, which you know that working in the bank does not make you rich. I will assist you to get your compensation fund and I believe you will reward me after a successful claim. Subject: FROM THE DESK OF THE CHAIRMAN FOREIGN DEBT FUND SETTLEMENT COMMITTEE. As the Chairman of this Committee, I received your message and it is well understood. I am writing you unbehalf of the Foreign Debt Fund Settlement Committee, regarding the payment of your compensations funds which ought to commence immediately haven received your details needed for the payment. Haven done all the proper verification exercise from all our department, we found you worthy of the cash compensations. In the Foreign Debt Fund Settlement Committee Compensation Payments Program Organized by the President of the United Arab Emirates ( Federation of seven Emirates ), Finance Minister, The Senators, House of Representatives and The Central Bank Governor,in conjunction with the United States Government, the British Government, European Union, Asian Union Organization, the World Bank Group and all the relevant Investigation Agencies of the government involved like FBI, CIA, British Scotland Yard, EFCC delegates, as a group we aimed at redeeming the Banks and other financial sectors image and also to try to put an end to the incessant scams reports by foreigners especially from US, KENYA, HUNGARY, PHILIPPINES, TURKEY, THAILAND , SINGAPORE etc. However, after this compensations has been paid, the Committee will decline any other report from you or and agencies fall into the hands of this perpetrators again. Meanwhile, as for now everything seem to be working in your favor, all that we require from you now is your maximum cooperation for smooth release of your compensation fund through our paying department to you. 1. A completed application Form (Fill the required info and leave others for official use). 2 . 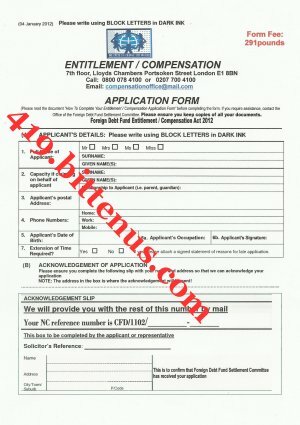 An Authorized letter of application requesting the transfer of your due funds as your COMPENSATIONS PAYMENTS to the provided details information provided (write as email). This letter by applicant is for official documentation purpose. 3. A scanned receipt of the sum of amount you have invested with your partners during the transaction period,which stands for the TRANSFER CHARGESof your expected sum of money and the processing of other required documents to back the said amount like. 12. IN THE FORM PURCHASED BY YOU. YOU WILL SEE A PLACE AT THE LAST OF THE FORM SAYING (THIS BOX TO BE COMPLETED BY THE APPLICANT OR REPRESENTATIVE) You are advised to get a registered Law Firm who works as a human right Law Firm in London, America or European Countries. Finally, We direct you to made every payment directly to the Chairman of the Committee in the person of Mr. Arif Mustapha, such as your application form fee and any other necessary payment involve in the claim of your compensation, through WESTERN UNION MONEY TRANSFER and details of the payment receipt clearly send to the committee email address for documentation.